Heat oven to 450°F. Unroll pie crusts; stack on lightly floured work surface. Roll to 17x12-inch rectangle. Fit crust into ungreased 15x10x1-inch pan, firmly pressing in bottom and up sides of pan. Fold crust even with edges of pan. Prick crust multiple times with fork. Bake 10 to 12 minutes or until golden brown. Cool completely, about 30 minutes. In 4-quart saucepan, heat coconut milk, half-and-half, eggs, granulated sugar, cornstarch and salt to boiling over medium heat; beat constantly with whisk 10 to 15 minutes or until thick and bubbling. Remove from heat; stir in rum, 1/2 teaspoon vanilla and 1 1/2 cups coconut flakes. Pour filling into cooled crust. Cool at room temperature 15 minutes, then cover with plastic wrap and refrigerate about 3 hours or until firm. Just before serving, make whipped cream topping: In large bowl, beat whipping cream with electric mixer on medium speed until soft peaks form. Add 1 teaspoon vanilla and the powdered sugar; beat on medium speed until stiff peaks form. Spread whipped cream evenly over top of chilled bars. Sprinkle with toasted coconut flakes. 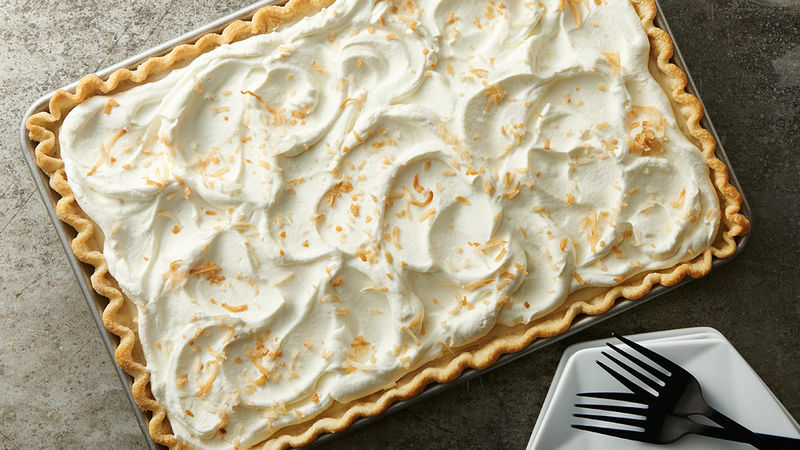 To toast coconut flakes, spread coconut flakes in even layer on small rimmed baking sheet. Toast in 375°F oven 6 to 7 minutes or until golden brown. Store leftover bars covered tightly in refrigerator.